On your calorie calculator, doesn't that figure out your total calories for your "current weight" and not your "goal weight?" Unless you put in your goal weight value, aren't you really calculating the number of calories consumed to maintain your current weight? You are correct. The Estimated Calorie Requirements Calculator estimates calories to maintain your weight. Once this is established, you can compare this number to the actual number of calories you are consuming. From here, you can determine if you need to initially increase or decrease your calories to reach your objectives while monitoring your progress with regular body composition tests. Also see Diet Development and Starvation Effect. I love this page: MeatExchanges! Usually you don’t see the corresponding fat exchange with the different protein types. Do you know it’s source? Thanks for your comments. I devised this alteration using basic math and logic so fats could be grouped into a single category instead of the various strata of meat, milk, and other foods based on fat content. It was largely inspired for my desire to calculate macronutrients programmatically which eventually lead to the Food Exchange Calculator. I grew up with the exchange lists since my step mother was a brittle diabetic. She used it to plan all of her meals and snacks. I later used for my own training, witnessed its evolution when studying nutrition in college, and used it through out my practice back when I used to consult clients. I am proud to say that The American Board of Family Practice (ABFP), a member board of the American Board of Medical Specialties, has linked to our Food Exchange Calculator on the ABFP website, www.abfp.org, as part of its certification program for family physicians. How do you use the food exchange journal? What kind of values do I place in the spaces and how do I calculate totals with the numbers provided? The Food Exchange Journal is intended to be used with the Food Exchange System. You can use this form to record and monitor your food intake throughout the day. Exchanges can later be converted to grams of Protein, Carbohydrates, and Fat and Calories using the numbers in the cells. Alternatively, you can also use the Exchange Calculator to make these calculations. It may take some time to look over and study the exchange system until you feel comfortable in using it. I've made a thread in the forums about this issue. The post is as follows: Food Exchanges. I'm being totally confused by this page! I don't live in the US so I'm trying to follow the Metric column, but it does not correspond to the US Unit column. For example, according to this page 1 US Cup = 250mL, but it does not! I think I understand why this error was made though: in the US, the standard for one cup is 8 fl. oz., but in countries that use the metric system it's 250mL. But still, 8fl. oz. don't equal 250mL! So basically it ends up giving different portions to people who use the different columns. The people following the US Unit column will get smaller portions than the Metric column. I actually grew up with food exchanges as a kid. My stepmother had been diagnosed with brittle diabetes when I was young. She controlled her blood sugar by multiple insulin injects each day and a strict diet prescribed to her by registered dietitians based on the ADA food exchange lists. As I took an interest in exercise and nutrition, she allows me on occasions, to arrange her exchanges into meals and snacks throughout the day. I personally had used the food exchange method throughout my own training, followed its changes during my college years in my nutrition courses, and have used it ever since as a trainer and coach as a way to prescribe diet and healthy eating to my clients. The point of the exchange system is to simplify macronutritional calculations. Foods are categorized into exchanges that best reflect their respective number of carbohydrates, fats, protein, and calories. You may be interested to know, if you were to look up the actual macronutrients in a reference such as Bowes and Church's Food Values of Portions Commonly Used, you will discover the exchange values are only approximations (sometimes off by 15% on some of the lower fat meat exchanges). If the idea of approximations are truly unsettling for you, one viable alternative is to keep a food journal with exact measurements and accurate descriptions of the food you consume. You can then query for the closest match in a dietary analysis computer program. Entering each item into the computer program will allow for a tally of a multitude of nutrients. Like the Food Exchange method, you may then make adjustments along the way according to the results of periodic body composition tests and other measurements. Thank you so much for such a detailed reply :) I guess that you do have a point though, I was being too picky about the trivial issues without looking at the bigger picture. 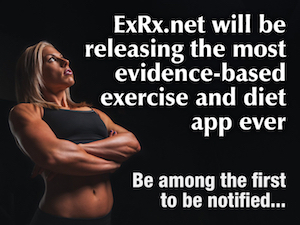 I'm loving ExRx.net so much, it has pretty much everything I need to improve my nutrition and exercise plan!